Was the shootdown of TWA Flight 800 a failed "false flag" black intelligence operation designed to put the USA on Mesopotamian patrol? Did the lessons learned by this experience prompt the "terrorists" to "go massive" five years later on 11 September 2001? Updated 14 February 2014 with letter to National Transportation and Safety Board Chairman Deborah Hersman. NEW YORK, NEW YORK * 17 JULY 2006 Citizen of the USA Stephen M. St. John addresses the international community in Washington and here in New York City, all members of the US Congress as well as other organizations and individuals, public and private, and points to a pattern of corruption in the investigations of the events of 9/11 and the shootdown of TWA Flight 800 10 years ago on 17 July 1996. Citizen St. John regretfully reports that the same officials who suppressed and disparaged numerous eyewitness testimonies of a rocket rising and hitting Flight 800 were, five years later, filtering out mainstream news reports indicating the debris of United Flight 93 covered an 8 mile wide zone extending from New Baltimore to Shanksville, Pennsylvania, a clear indication of the shootdown. 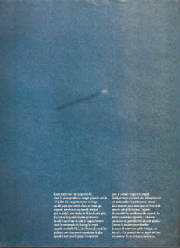 Citizen St. John notes that the Internet has made it impossible to suppress the names of reporters and eyewitnesses and their observations made on 9/11, whereas comparatively fewer Americans are even aware of Linda Kabot's chance photo of a cruise-type missile passing over East Quogue and heading out to sea minutes before the white flash characteristic of high explosives brought Flight 800 down (See Paris Match, 9 November 1996). For more information Citizen St. John invites his readers to see his article published in Liberty News, the official newsletter of the USS Liberty Veterans Association http://www.ussliberty.org/newsletters.htm (First Quarter 1997) which here follows. It may well be that the TWA Flight 800 shootdown was an early attempt to instigate an invasion of the Middle East which served to teach the conspirators the need to "go massive." Will the USS Liberty incident shed light on the TWA Flight 800 disaster? Take a ruler and a map and see for yourself: a line drawn southwesterly from the US Navy submarine base in Groton, Connecticut and intersecting East Quogue on Long Island (where a woman, by sheer happenstance, snapped a photo of what looks like a missile on a southwesterly course in the evening twilight of 17 July) will lead to the very location off Moriches Inlet where TWA Flight 800 exploded in a ball of fire. The US Navy, an indispensable if not disinterested principle in the investigation, may indeed have been the cause of the explosion. Anyone concerned about the destruction of TWA Flight 800 can learn a practical lesson from recent history. The survivors of Israel's attack on a US Navy electromagnetic surveillance "spy ship," USS Liberty, on 8 June 1967, while on a National Security Agency mission in the Eastern Mediterranean, and just hours before the "miracle" taking of the Golan Heights at the close of the Six Day War, will renew their petition for a full and impartial investigation by Congress at their next reunion, which will take place in Washington on the 30th anniversary of the attack. They allege outright lies and coverup by both the Israeli and US governments. Any thorough investigation of the USS liberty incident would have to take up the issue of a US Navy submarine in the vicinity of the Liberty during the attack. Congressman Gary Ackerman's written statement about submarine photography of the Liberty while it was under attack has led to the conclusion, which has been confirmed by a reliable source in the Central Intelligence Agency, that some submarines are not officially registered with the US Navy so that their "national security" operations can be denied by the US Navy and the US Government with a high degree of plausibility; hence, the Liberty survivors' 30-year wait for justice. 30 years, that is, and still counting. Typically, a newly built submarine goes on "shakedown cruises," sometimes for years, before finally being accepted into the fleet. During such cruises a sub could from time to time engage in covert, "black" operations; whatever the mission, for better or for worse, it calls for utmost secrecy and lacks the normal requirements of accountability imposed on a fully commissioned sub. So when the head of the Navy operation involved in the TWA Flight 800 investigation, Admiral Edward Christiansen, says that the US Navy has accounted for all missiles on all ships operating within range of the ill-fated Boeing 747 on the evening of 17 July 1996, his statement must be taken with a grain of salt. Former Secretary of State Dean Rusk, former White House Counsel Clark Clifford and former Chairman of the Joint Chiefs of Staff Admiral Thomas Moorer, who have all issued statements in their retirement years in support of the USS Liberty survivors' quest for justice, would certainly not want to jeopardize former Admiral Rufus Taylor's covert submarine operations during the Six-Day War. Nearly 30 years ago, however, when they bore their Cold War responsibilities, President Lyndon Johnson and Defense Secretary Robert McNamara could very well have seen the wisdom of backing down in the face of espionage and blackmail; indeed, one of Israel's official versions of the "accidental" attack on the USS Liberty, known as the Yerushalmi "preliminary report," which was presented to the White House by Ambassador Evron, carried in its opening paragraphs a broad hint that any rigorous investigation of the USS Liberty incident would necessarily entail collateral confirmation of illegal submarine activity in the vicinity of the Liberty. Department of State legal adviser, Carl F. Salans, found the Yerushalmi report grossly inadequate – indeed, Evron himself asked that it not be released to the public – and both Dean Rusk and Clark Clifford expressed their belief that the Israelis were not telling the truth. But in the case of the USS Liberty, an ally's threatened exposure of supposedly covert submarine activity would reveal the USA as a party to the dispute, which, according to article 27.3 of the Charter of the United Nations, disqualifies the USA from voting in the Security Council on any matter pertaining to the Arab-Israeli conflict; here, the Israelis knew exactly how far they could safely go. The USA, taking the long view of "land for peace" and intent on giving Israel Arab lands as "bargaining chips" for leverage in negotiations, did not pursue the matter. But these violations of international law and the Constitution of the United States, which makes our UN treaty obligations the law of the land, are telling precursors of our selective enforcement of UN Security Council resolutions as they apply in the near East. As to the question of why Israel would attack such an important ally, it must be understood that the US military aid was underhanded and, to this day, top secret. But the sudden and unexpected presence of the USS Liberty within listening range on the fourth day of the war, when the only remaining objective point was the Golan Heights, represented an unacceptable security risk to the entire Golan operation, which retired Israeli Major General Mattiyahu Peled has since called "the private venture of Moshe Dyan and a few generals who were also interested in this adventure." Behind the USS Liberty story lurks the explanation as to how the Israel Defense force, led by a faction operating outside the counsels of the Israeli government, captured the very well fortified high ground in less than 24 hours; Jimmy Carter's remark about the "peculiar confluence of Israeli and Syrian interests" becomes clearer, as does Henry Kissinger's advice on the Golan that there's no need to find a solution when one doesn't exist. On the other hand, in the case of TWA flight 800, the stakes are not nearly so high. Admitting the truth will not impose any strategic or tactical disadvantage, real or imagined. Refusal to admit what is so obviously a missile coming from Long Island sound from the general direction of the submarine base in Groton and the nearby General Dynamics "Electric Boatyard" (where submarines are made) to the fatal point of impact off Long Island's south shore only widens the credibility gap between the government and the public. Despite overwhelming evidence from numerous and reliable eyewitness testimonies of a rocket like object in the area or of the missile suddenly rising to intercept TWA Flight 800 just before the explosions, most criminal and air safety investigators stubbornly cling to the onboard bomb theory or the mechanical failure theory as the most likely explanation for the crash; certain predatory lawyers concur, if only because they see these explanations as the most lucrative. As with the USS Liberty, Near East politics figures in the decision-making. The head of the New York City office of the FBI, James K. Kallstrom, invoked memories of the 1983 suicide bombing of the Marines barracks in Beirut within days of the TWA tragedy. And, weeks later, as the local New York tabloids flashed pictures of the smiling Prime Minister Bibi Netanyahu and his wife aboard a US Navy aircraft carrier off the coast of Lebanon (where the 1982 Israeli invasion, condemned yet paid for by the USA, is not forgotten), one of Kallstrom's men was dismissing Hard Copy's 1.5 second TV broadcast of the controversial photo that had been taken at a gathering in East Quogue by Linda Kabot only moments before the TWA flight 800 explosions; the cylindrical object glowering at one end and seeming to be on a southwesterly course, he said, "could be anything". 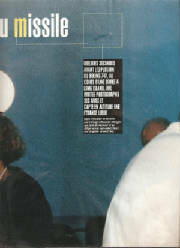 The photo, finally made available for close inspection in the 9 November 1996 issue of Paris Match (Bravo, Etat Quatrieme!) certainly deserves a better explanation than that! Maybe Kallstrom and his men have seen Chuck Norris and Sylvester Stallone kill one too many an Arab on the big screen, and this is why they are so attached to their theories. Maybe they place too much reliance on the smoking science of smithereens. Whatever the case, it is time for them to get real and go with the best evidence, which indicates a missile launch from one of our own ships, most likely to the north and east of the crash site, where there are major installations for submarines. Such a missile launch best explains the white flash of a powerful explosion that instantly decapitated the Boeing 747 and in a moment was followed by the fuel-fed ball of fire. But only the very highest level powers of the President of the USA can effectively sort out exactly whose submarine may have been at fault: a US Navy sub or one of the unofficial class of newly built "black subs" that are sometimes used for clandestine operations, of which the FBI and even most Navy brass have not even the foggiest idea, but which, as the USS Liberty survivors know from old experience, can spell of the law's delay and sink justice a full fathom five. 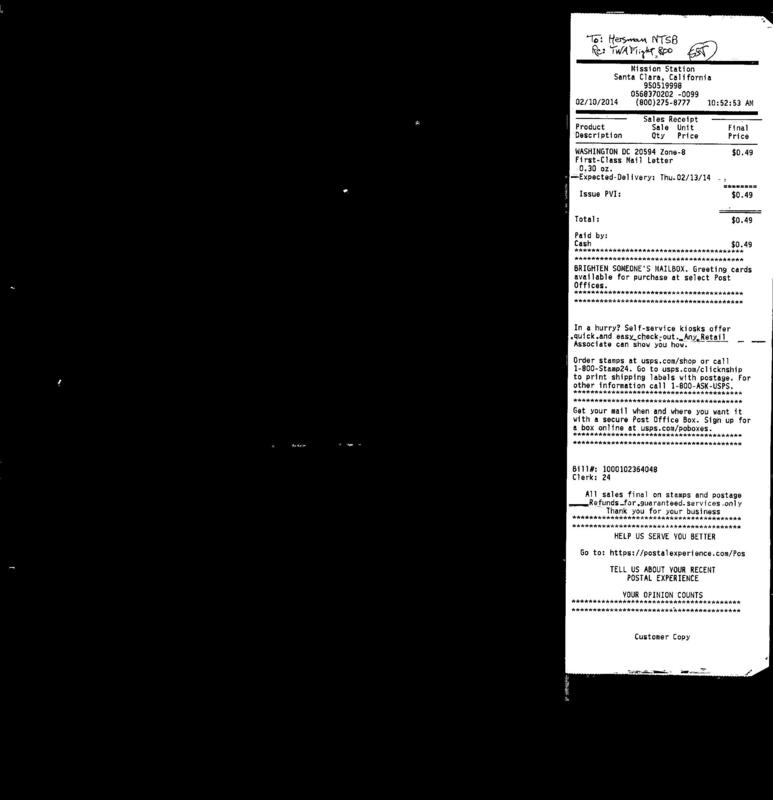 I write to request reconsideration of the Board’s findings and probable cause determination regarding TWA Flight 800, and hereby second the petition received by the NTSB on 19 June 2013 pursuant to 49 CFR §845.41, which, according to the NTSB press release of 28 June 2013, is currently under review. 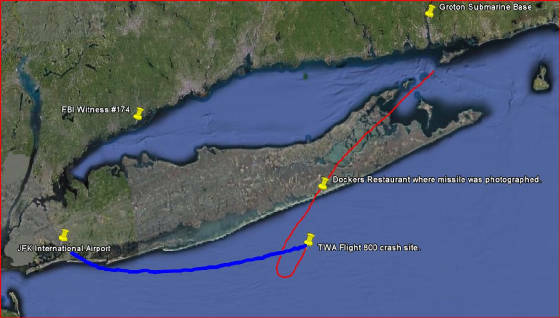 The methodology of the investigators and their consultants fails to take into account the observation of FBI Witness #174 who was in Rowayton, Connecticut, which is south by southwest of Norwalk and at least 50 miles from the site of the demise of TWA Flight 800 and therefore more than three times the maximum distance provided in the Missile Visibility Test. FBI Witness #174 saw a distinct point of light rise from the horizon until it met the jet and then exploded. Such very important eyewitness testimony from a retired US Navy officer tends to rule out a shoulder-launched missile (which is the presupposition of the investigators and consultants) and to allow the possibility of a much larger type of missile. The bias of the investigators and their consultants reveals a stunning lack of comprehension of the wider range of possibilities with respect to the actual cause of the explosions aboard TWA Flight 800, which includes a tragic friendly fire incident or a false flag provocation carried out by cyber pirates. This deficiency gives good reason to reconsider the findings and conclusions of the Aircraft Accident Report. Let me add that I am deeply troubled by the accusations of criminal wrongdoing made by former key investigators and revealed in Kristina Borjesson and Thomas Stalcup’s documentary film TWA Flight 800. These accusations as well as the evidence offered by these investigators in this great film provide more good reasons to reconsider the findings and conclusions of the Aircraft Accident Report. Finally, let me point out that I was among the first to formulate a “conspiracy theory” regarding TWA Flight 800 in November 1996. Please see http://www.show-the-house.com/id13.html . I would only add that the possibility of a cybernetic crime deserves attention. Infiltration of computer systems, telecommunications piracy, remote control of aerial vehicles and compartmentalization in the military may be key factors in what I believe was a very serious crime on 17 July 1996. I am very concerned that I have not yet received a reply or even an acknowledgment of receipt of my letter to you of 10 February 2014. This letter contains a petition for reconsideration of the findings and conclusions of the TWA Flight 800 investigation and report; it was mailed on the 10th of February 2014 from Santa Clara, California and a copy, along with a photo of the USPS receipt, is posted on my website at http://www.show-the-house.com/id13.html & http://www.show-the-house.com/id87.html. A copy follows in this email for your convenience. I expect and demand a reply. It is now 26 February 2014. Your office has had ample time to respond. Why haven’t I heard from you yet? Also, please note that my petition is a separate petition even though I also second the petition that the NTSB now has under consideration. I give different grounds for my petition for reconsideration. 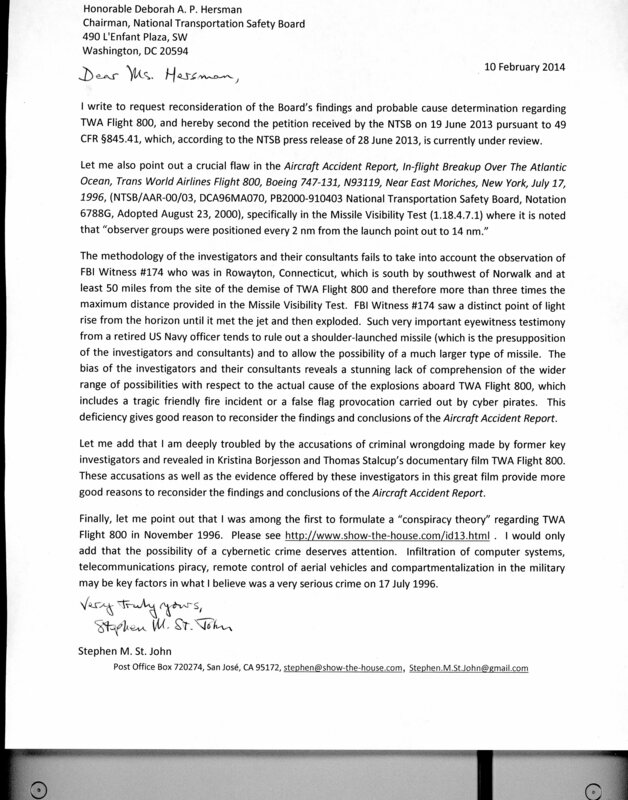 I am an independent researcher who would very much like to have your support for my recent petition for reconsideration of the National Transportation Safety Board’s findings and probable cause determination on the demise of TWA Flight 800 back on 17 July 1996. Let me therefore refer you to my 10 February 2014 letter to the NTSB Chairman Deborah Hersman, a copy of which follows in this email. You can also find copies posted on my website webpages at: http://www.show-the-house.com/id13.html and http://www.show-the-house.com/id87.html. Also, let me answer your question which I found on www.thestreet.com, where you say, “To have a conspiracy to cover up a criminal act of this magnitude would have taken hundreds and hundreds of people agreeing to keep our mouths shut. On what planet does that happen?” My short answer is, “that” has happened on this planet Earth many times. My long answer is the Talmudic law of the Moser (informer). For more please visit my website webpage at http://www.show-the-house.com/id10.html. Frankly, the CIA portrayal of the final seconds of flight of TWA Flight 800 is preposterous and ridiculous, and on the international stage the USA’s credibility is lost. This is a grave danger to our national sovereignty and security. This is why I am asking you to stand with me and my petition. You only have to allow for the possibility that you have been very cleverly deceived in order to do so.